Working on Quilts of Valor is so rewarding. 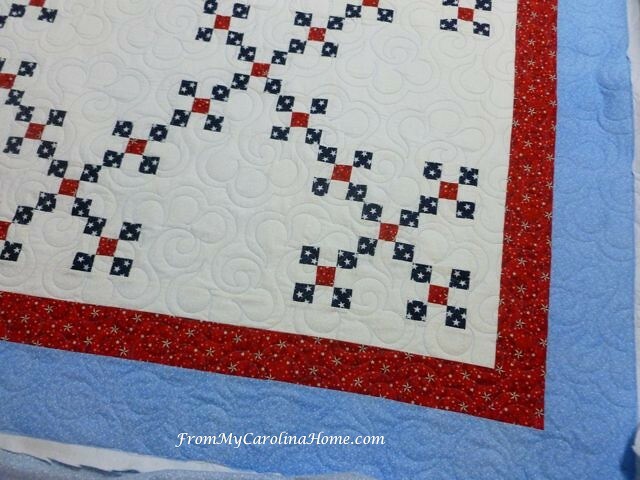 The red, white and blue patterns are as varied as the quilters who make them. A few months ago, I made one as part of a Fat Quarter Shop Classic and Vintage event, a double nine patch. I sent it off to the local QOV chapter and forgot about it. Then, a couple of weeks ago, the chairperson sent me an email asking me to be a part of the presentation ceremony. 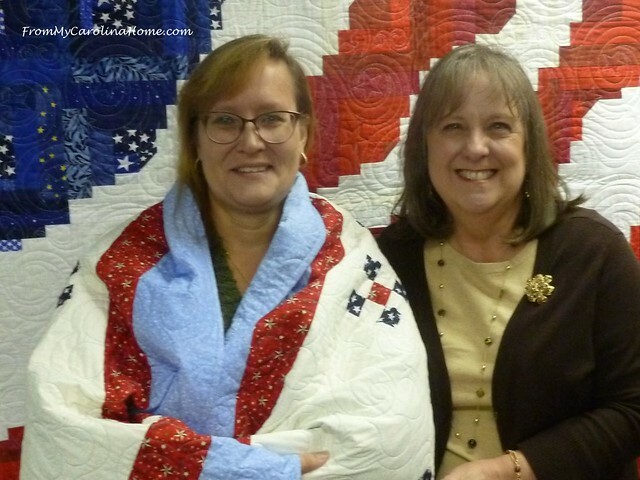 My quilt was to be given to a young woman named Kelly Weaver, an Air Force veteran. I had to say yes to that. Here she is in the front row after her quilt was presented. 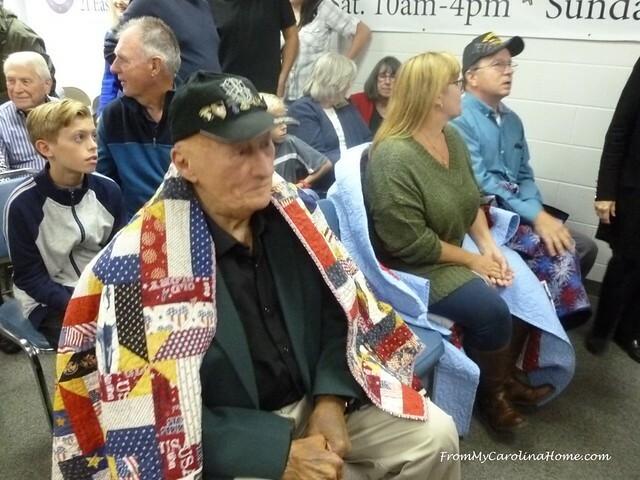 The presentation to each vet includes a brief overview of their service, then the presenter reads a statement of appreciation for their service, and the quilt maker drapes the quilt over the shoulders of the veteran, wrapping them in a hug of warmth and gratitude. My eyes filled up as I wrapped the quilt around her shoulders, hugging her and whispered “Thank you for your service” in her ear. Later, I got a photo of her, and her father who was also honored that day. I only wish I had gotten his name too. He didn’t know he was going to be honored that day with his daughter, it was a total surprise for him. 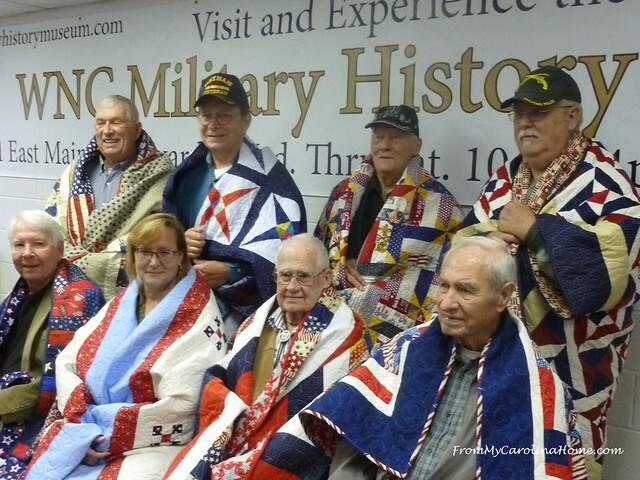 Eight veterans were honored that day at the Western North Carolina Military History Museum in Brevard. We all got a chance to talk with them at a reception following the quilt presentations. When Didi called to see if I could quilt another one for her group, I had to say yes. 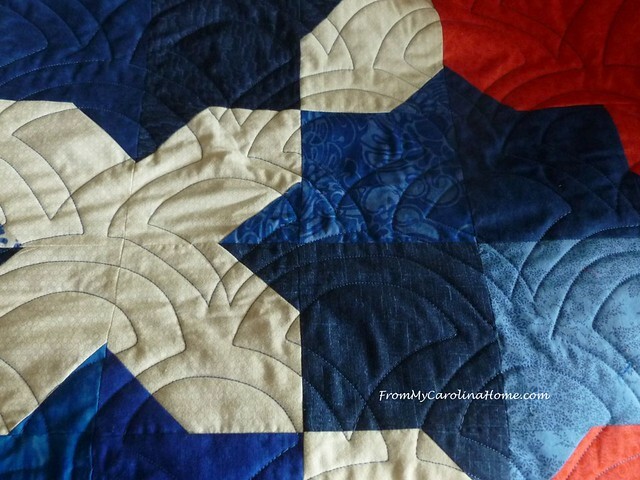 She delivered a pretty blue star quilt with a red border. I do not know what pattern this is, but it is a nice one. She chose a medium blue thread and a pantograph called Geisha that I used on my Japanese Art Quilt. It looks a bit like a clamshell, or Baptist fan. She provided the batting, and it felt like Warm and Natural all cotton. The quilting went quickly, and I had it done in a jiffy. No broken threads, LOL!! Yesterday, I handed it over to a friend who will do the binding. Now I am inspired to do another one all on my own. 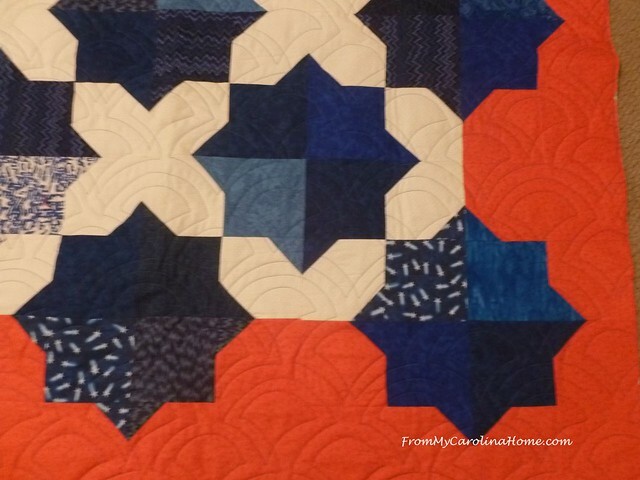 I’m really involved with the Carolina Hurricane Quilt Project, but I will work on another QOV quilt as soon as that project has its five quilts done. I have enough blocks to do seven quilts now, so I do not need any more. Look for an update on the 30th. At this season of gratitude, with Thanksgiving tomorrow, one more thing to be grateful for is our freedom, and the men and women who help keep us safe. If you ever have the opportunity to make a Quilt of Valor and go to a presentation, do it. It is an experience that you won’t forget. It’s Black Friday Deals Week at Amazon, save on all kinds of gift ideas and household items. Select mystery books up to 50% off paperback. Try Amazon’s Audible Free 30 day Trial and get two free audio books plus 30% off any additional book purchases. Books are yours to keep. Can’t remember the name (Serious Senior moment here), of the last QOV you’ve shown, but I believe it’s the pattern Marti did at the last quilt retreat in September. It’s available for free somewhere on the net…sure wish I could remember the name…Windspell or something on that order. Have a wonderful Thanksgiving. Hi Carole! What a wonderful story to share today! 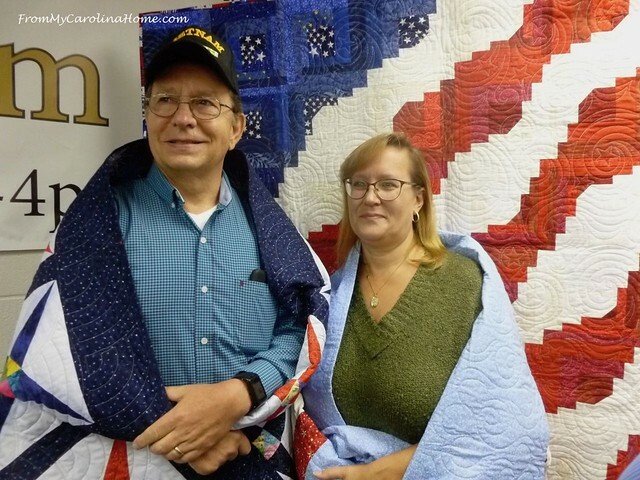 How wonderful that you got to honor Kelly with her quilt, and to meet her dad as well. My tears definitely would have been watering at the ceremony as they are watering right now! Happy Happy Thanksgiving to you! ~smile~ Roseanne P.S. 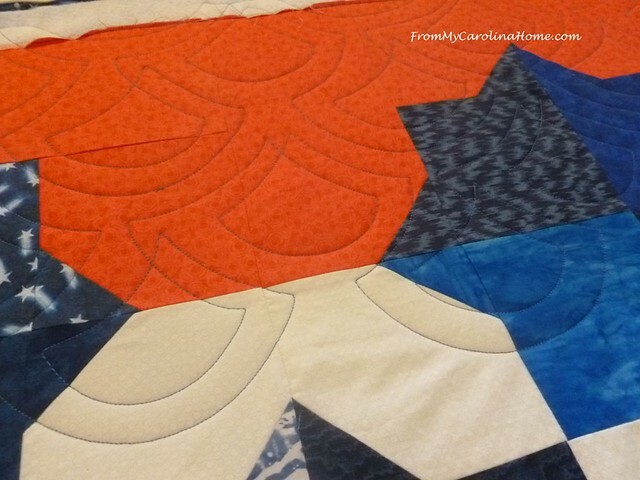 I’m going to PIN your closeup shot of your quilting – very cool and I love the baptist fan design. Really nice variation. Thanks!! 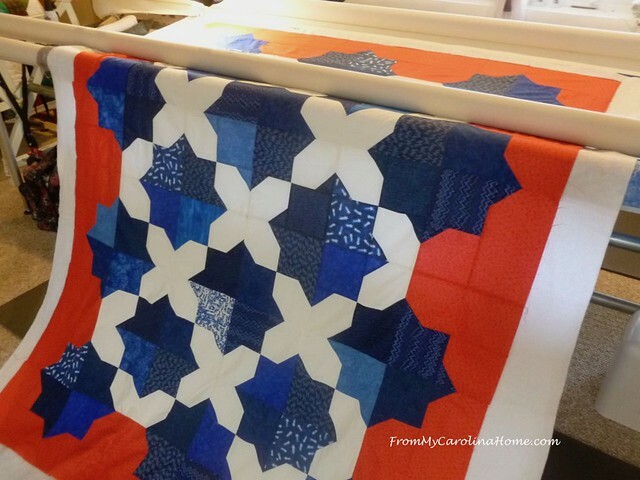 The Agent Orange widows have a traveling quilt, I saw it in 2005, it took up the wallls of a gym size room on a post in CA during a Nam vets reunion (the small post may have gone in the fires last year in the wine country!) I took a few days off and went all by myself, it was hard but good. I’m ashamed to say in the chaos and frantic rush after his death that I didn’t do a block for Jim, as AO was a cause of his cancer. The woman who headed it up has since passed herself, but I heard the quilt was still traveling for a few years. My heart is always with the military and I keep a list of our division veterans here at work. We have all sorts, but the Viet Nam veterans are getting older, retiring, and sadly AO is still killing them. The peak was 30 years after Nam, dioxin stays around that long and does its destruction slowly. I’m proud to say one son and three nephews have served. The nephews served in the Middle East and my son on the Ronald Reagan. They come home changed. Mostly for the better, but we don’t always see the injuries, and some remain in darkness for the rest of their lives. PTSD is insidious, and my opinion is the answer is to be with other vets who understand, and even if their family doesn’t, we can love and listen and respond when necessary. Bless you and your guild for all the loving care, Carole. They deserve it. Big teary hug from sharon in colorado. Have a blessed thanksgiving dear lady. Bless you for keeping up. My 1st husband was a Viet Nam vet, and died about 14 years ago from Kidney cancer, before AO was identified by the VA as a “contributing cause”. 😦 I spent 37 years working with the military and served 5 years. These men and women who have served in the Middle East are changed forever. Now, it is the mental health and the burn pit effects they must deal with. Your quilts are just exquisite. Both are just so charming, but the double nine-patch just captures me! 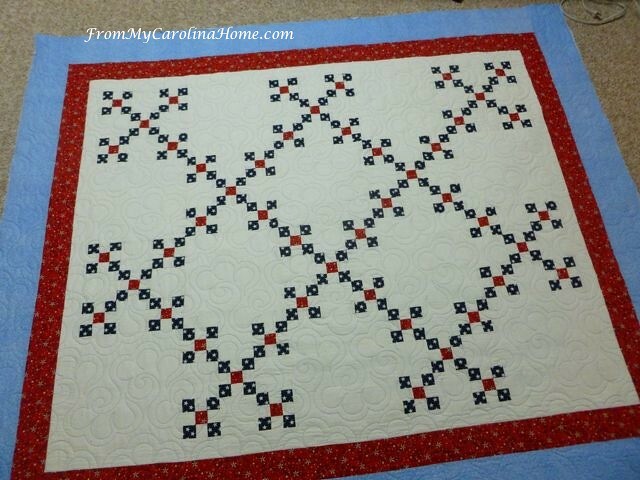 And the quilting motifs are just right for each pattern. Thank you for doing this for those treasured members of our community. We wouldn’t be here without them. And Happy Thanksgiving to you and your husband! I;m very thankful I found your great blog with such inspiration—I’ve tried (am trying) many of your ideas. All fun! Thank YOU ! How awesome that you got to gift the quilt you made, and I can only imagine how special it must have been for father and daughter to be honored on the same day! Carole. you are a thoughtful, caring and giving person, and I really admire those qualities in you. It’s usually the busiest people, who find the time to go the extra mile, and you will be rewarded for all your good deeds, when you walk up to the pearly gates with a quilt in your hand. Sorry, just couldn’t resist. What a wonderful service you are providing to the QOV project. Thank the service members for their service to the USA, and THANK YOU. This would be the finish to dream of, and what gifts to them both and the others. Service given, and QOV are one way you show how thankful we all must be for freedom, up north and here down south. Ditto to lv2. What a great posting! Carole, you are going to have so many stars in your crown you will have to wear a neck brace in heaven!!! If anyone wants the pattern for that last on that you are quilting, it is Speedwell and free on Moda’s site. 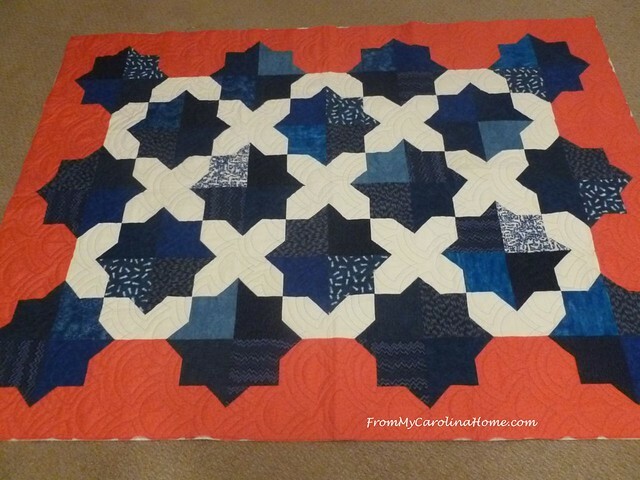 Wonderful post, the quilt you made is beautiful and it is so good to meet the person who received it. Wonderful to see father and daughter presented at the same time. A beautiful story Carole! Enjoy a lovely time of thanks with your friends and family! Hello Carole and God Bless You for all that you do and give. I feel honored that you shared such a special part of your life with us. I agree with what everyone has said in the comments! You continue to be such an inspiration in my life and are the most giving caring person. Thank you for contributing to our Veterans who all deserve to be honored. Have a fabulous Happy Thanksgiving. What a wonderful opportunity to actually meet the recipient of one of your gifted quilts. I say it often, but I can never say it enough: Thank you for all you do. Thank you for sharing your story on presenting a QOV-how awesome that you got to present it! Happy Thanksgiving. Beautiful quilt and so nice that you got asked to be a part of the ceremony. I didn’t know about that part. I’ve had a QOV on my Quilty Bucket list for a few years. That is delightful to see.How special to see it presented and know about the recipient.